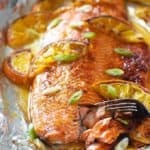 This easy and super fresh and flavor Honey Glazed Salmon with Orange and Ginger will become a regular on your recipe rotation! Rinse and pat dry the salmon fillet and lay on top of foil. Liberally salt and pepper entire fillet. Combine honey, grated ginger, grated garlic, orange zest and orange juice in a small bowl. Place slices of one orange around fillet. If you want a bit more caramelization, broil for an additional 2-3 minutes.